Everything looks great so far, and the rutabagas look fine to me. Though I am by no means an expert -- I had one good year with them, then the bed they were planted in 2nd time got club foot. Soooo disappointing! I sowed the last of the seeds this spring, just to get rid of them and I have one nice one growing in a raised bed, and a handful of tattered looking ones in another bed. Do you not get the typical crucifer/brassica pests? Cabbage whites even? They love rutabagas and turnips as well as the usual cauliflower, broccoli, cabbage, etc. etc. Here, now that it's gotten hot, the cross-backs are all over the remaining broccoli and kale, and even a harlequin bug has made an appearance (a bit early, if you ask me) ugh and double ugh! -- basically time to pull the plug on most of them and make way for something else. I honestly had to google all of them just now. I have ben told by a few gardeners (in my area) that we do get a blue butterfly or moth that lays eggs in the cabbage, and that caterpillars can be an issue, but more the blue butterfly/ moth. I do have a cloth cover purchased to spread over the cabbage beds. I have never seen any of the rest. I do have a few small signs of something munching on cabbage leaves and broccoli leaves, but I don't see anything in the beds or on the cabbages, aside from some small black flies and house flies. I was assuming it may be them. Also, a few of my turnips must have had two seeds on the planting hole, and did not get thinned out after they grew. Should I thin them out now, or should I leave them in hopes that two turnips will grow? I'm leaning towards thin them in order to get a turnip root to grow, instead of just turnip greens.... which i have growing in another bed. Im sure our winters help determine which bugs will usually establish in our area. Our winters are usually 6 months long, with average ambient temperature (without windchill) of -25 to -30 Celsius (~ -13 to -22 Fahrenheit). Spring and Fall are ~ 1month each, and summer is typically 20/25 Celsius on average. But it can fluctuate quite a bit between days. Yesterday was 26 celsius, today was 12 celsius. We also get plenty of rain. Summer days are very long (5am/ 6am until about 9pm/10 pm). Between mid June and mid September. Winter daylight is depressing at times (8am to 4 pm). Also I have no way of having a winter garden... unless growing snow counts! Typically the raised beds have about 8-10 feet of snow on them by the time spring arrives. The biggest insect problem here are the mosquitos and the small black flies. Which are an extremely big problem in the evenings while tending to the garden. My growing season is realistically 12 weeks long, but can vary onwards of 14/ 15 weeks depending on the temperatures in the late spring and early fall. A few more pics this week. I examined the cabbage and underneath the cabbage leaves and could not find any insects, aside from small black flies. They are a nuisance all over our town. I took some advice and decided to cover the cabbage with the row cover fabric. I purchased a heavy duty type. Installed it on hoop houses and clamped to heavy lengths of wood to ensure it does not blow off the hoop houses. Pics are below. Broccoli is started to head on just about all 22 plants. Small, but its started. Any idea what is wrong with this tomato? I just noticed it the other day. These are gypsy peppers. I noticed the small brown spot on just one of them near the bottom. Its small, but I was wondering if its BER? I added lots of Calcium to soil prior to transplanting. I used gypsum. The others are not showing similar brown spots. Just wondering. The last weed -- it's kind of powdery underneath right? I'm pretty sure these are lambsquarters but could also be another species if narrow leaved. Both are edible weeds. Let some grow when distanced enough from main crops to not bother them while they are both small. applestar wrote: Someone sent me seeds for what she called Aztec Broccoli and included a link for more info (http://seedsrootsleavesfruits.blogspot. ... ccoli.html). I realized I have a wild cousin and tried harvesting the tiny floral buds. They were yummy as garnish in a chicken soup. She's also sending me Spinach Tree seeds. I have wild cousin to that as well, which we all know as lambs quarters (also pictured above). Hers is gorgeous frosty dark blue-green though, with magenta new leaves... and of course HUGE. I've seen them called "Magenta Spreen". I agree. 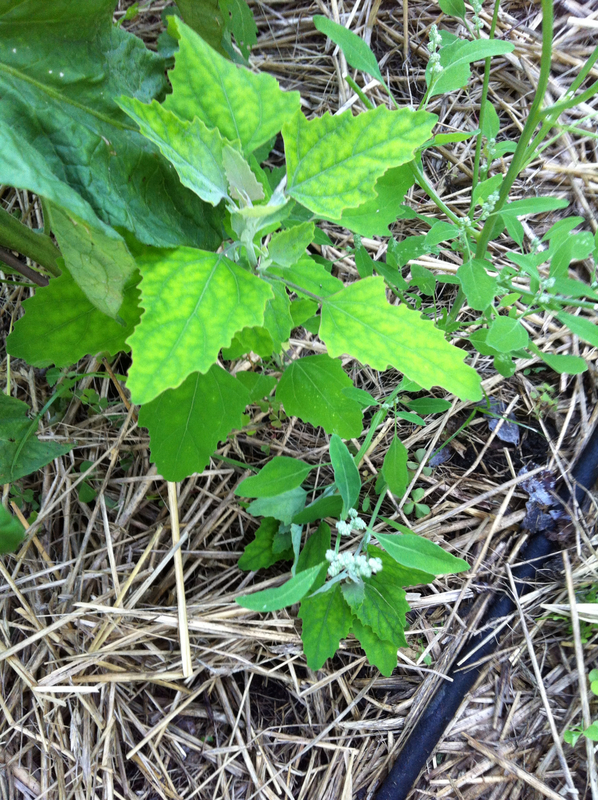 I think your weed is lamb's quarters (aka wild spinach and many other common names). It is one of the best edible weeds, very similar to spinach and very nutritious. But it looks odd to have tomatoes producing and broccoli just setting heads at the same time. But 12 C (54 F) is more like broccoli weather than tomato weather. and 26 C (79 F) is more like tomato weather, so I guess it averages out. So its wild spinach? Well that works for me... I love spinach. I always pile it into my lasagna and some soups... Ill try some and see his I like it. Its very resilient! Almost stubborn! lol... an way too much if I let it grow. It seems very invasive. And grows so quickly. rainbowgardner..... I never did see it that way regarding the broccoli and the tomato... I just hope for everything to be harvestable at the same time, or at least before the end of September! Our weather fluctuates so much from day to night. Im a little jealous of your 28 week grow season! April 1, Im still cross country skiing, and its considered our best snowmobile weather! SO i covered my cabbage on Sunday as some addd protection... just in case. I checked on them today... now I have slugs on the cabbage. I picked 5 off one cabbage. I was frustrated, and decided t ask for a solution before I went out to pick them all off. They are very tiny and starting to do some damage to the leaves. HELP! What do I do to destroy these evil pests that are devouring my cabbage? Is picking them off the fastest method? I didn't have this issue until I covered them... maybe just a coincidence. But I also have a lot robins and swallows (More swallows as they seem to drive the robins away) kicking around my area...maybe covering them took away the food source for the birds? These are my two lazy helpers.... they wait for the birds to show up, just so they can chase them! Pics of my cabbage since the slug attack earlier this week. - Cursed on slugs quite a bit! - Installed 14 beer traps in total. - Placed a piece of 1x6 board between each row (In an attempt to provide them shade from the daylight.... and of course me checking the board in the daylight). - Removed any leaves sitting on the ground that have yellowed. - placed 1x2 boards on both side of the plants in an attempt to get the leaves off the ground. - Manual evening slug removals... the first two nights there were quite a few... about 40.... since then they have reduced to about 1 a day. -... and cursed a lot! This what the two heavy damaged plants look like. Im not sure what I should do with them... trim the leaves... or just leave it? These are good ones. Most look like these. I might have about 2 heavy damaged ones, and 3-4 with one leave damaged. I have about 15 good ones. I think you've done all the things I might have done for slug control. I wouldn't remove those leaves. ...I'm envious you don't have to deal with all the other issues -- with the summer serious heat it's the moths as well as the butterflies -- moths lay egg clusters and they all hatch at once, butterflies are egg dumping and lay dozen or more eggs per leaf... and now the harlequin stinkbugs are laying egg clusters on all cabbage family plants I have left in my garden.... AND here I am trying to GROW fall stuff.... With the all the thunderstorms, slugs seems to have resumed. High pest pressure.